What’s next for a company that just made spaceflight history by sending a rocket into orbit and safely landing it back on Earth? Why, doing it again, of course—but this time, on an ocean platform. That’s the latest bold challenge SpaceX plans to take on, according to an NBC News report verified by Gizmodo. The launch will reportedly take off January 17th, from Vandenberg Air Force Base in California, and will be carrying a new NASA satellite that’ll provide high resolution data on the ocean surface and sea level rise. SpaceX made history last month as the first company to send a rocket into orbital space and land it back on Earth. It’s a first major step toward the company’s aspirational reusable rocket system, one which would dramatically cut the cost of sending payloads into orbit. (In November, private rocket company Blue Origin became the first to send a rocket to suborbital space and back). 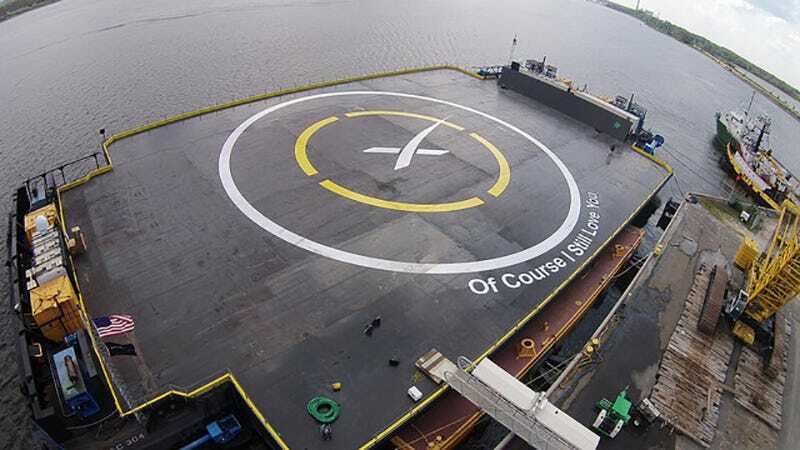 But if you’ve been following SpaceX’s reusable rocket saga, you’ll know this is hardly the first time the company has flirted with ocean platforms. (In fact, it’s the company’s fourth attempt). Prior to sticking its landing at Cape Canaveral Air Force Station last month, SpaceX made several failed (but close) attempts to land a Falcon 9 rocket on a drone barge in the middle of the ocean. After a June launch disaster during which a faulty strut caused a Falcon 9 to blow up in mid-air, SpaceX went radio silent for about six months. In December, the company announced that it’d be attempting a rocket landing once more, this time, on solid ground. In theory, sticking a landing at Cape Canaveral is easier than touching down softly on a shaky ocean barge. Now that the company has stuck the land-based landing, it’s decided to double down on its ocean barge goal. Being able to land rockets in the ocean means far more flexibility in terms of where launches can proceed. In theory, a mobile landing site could be placed wherever it’s most fuel efficient for a given mission to return to Earth. It also (obviously) poses much less risk to nearby infrastructure and humans. January 17th’s launch won’t feature the exact same Falcon 9 rocket SpaceX landed in December. Even though the goal is to build rockets that can be used many times over, Elon Musk wants to save his first “reusable” Falcon 9 as a historical piece. While the Falcon 9 that launched in December was a new model with more fuel and a more efficient propellant system, this month SpaceX will be launching an older, 9.1.1 rocket—the same type the company has tried to land on ocean barges before. This particular rocket was supposed to launch a while back, before the June mishap, but never ended up making it off the ground. Moving forward, SpaceX says that all new Falcon 9 rockets will be built according to the upgraded design, which exhibits 30% better overall performance, thanks in part to a deep-cryo liquid oxygen propellant system. A static test fire of the rocket’s engine is planned for Sunday, according to NASA. Will SpaceX make history for the second time in two months? We’ll have an answer very soon. Correction: An earlier version of this post stated that the January 17th launch would involve the latest Falcon 9 rocket model. In fact, SpaceX has confirmed that the launch vehicle will be an older, v 1.1 rocket. Top image: A SpaceX ocean barge, similar to the one that the company will use in its January 17th launch.